Home >> Generated from JAN's SOAR Information System on 4/21/2019 12:30:07 AM. 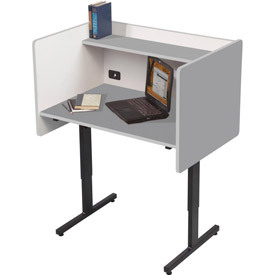 The Gray Study Carrel provides privacy for study or testing areas, and is constructed of high-pressure laminate with finishes that blend into any room's furnishings. The white interior provides a bright work area for students and allows for projector testing. The top shelf measures 8" deep and holds books or other materials. A grommet in the back panel keeps cords neat and organized. The unit is height adjustable from 38-1/4" to 46-1/4" high.